For how effective Mitchell Boggs was for the St. Louis Cardinals as a set-up man last season, it is difficult to comprehend how far he has fallen this season. In just under 15 innings pitched, he has allowed 21 hits and 18 earned-runs. He has accumulated 15 walks to just 11 strikeouts–a strike-to-walk ratio that a reliever cannot have if he wants to be successful. Since being recalled from Triple-A Memphis, Boggs has picked up where he left off before being sent down–allowing earned-runs in three of his four relief appearances. Last night, while trying to preserve the first ML victory for Michael Wacha, he allowed a home run to Jeff Francoeur who had not hit a homer since April 10th this season. In short, it is time to part ways with Mitchell Boggs. He has options and can be sent down to Triple-A to iron out his mechanics, but it has become much more than mechanical issues for Boggs, now. He has a solid arm, and at just 29 years old, he probably has a lot left in the tank, but for the sake of the Cardinals, he needs to be outright released. The bullpen has no place for him this season, even with Jason Motte out after elbow surgery. 7th Inning: Seth Maness with Randy Choate to take care of left-handed hitters. 8th Inning: Trevor Rosenthal. His stuff is dominant enough to handle both right-handed and left-handed hitters. Plus, it is a good spot for him to develop into the Cardinals future closer. 9th inning: Edward Mujica. He has been perfect this season at 17/17 on save opportunities. Thus, there is no room for Boggs and if he is limited to long-relief or use in low-pressure situations, then the Cardinals are better off using someone else–someone down on the farm that could use those innings for long-term development. Mitchell Boggs, thank you for all you did for the Cardinals last season, but it is now time to say goodbye. The Cardinals’ organization and Cardinal nation wish you the best of luck. Since replacing Jon Jay as the everyday leadoff hitter, Matt Carpenter has done one thing better than just about every one else–get on base. In 138 plate appearances at the top spot, he has a .420 on-base percentage–the second highest OBP in the MLB (second to Cincinnati’s Shin Soo Choo). The Cardinals are paying him a mere $504,000 this season. Based on his performance so far this season, the team is already getting a return on its investment. 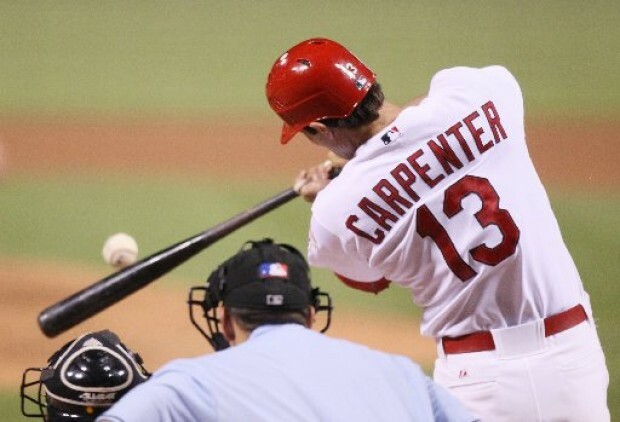 Carpenter is fully capable of playing 3infield positions–second base, third base, and first base. He can also fill in at one of the corner outfield spots if necessary. $504,000 for a player capable of playing up to 5 positions while getting on base 42% of the time is an incredible value for the Cardinals. For those of you that have not read the book or seen the movie, I recommend you follow the links that I have provided. You will not be disappointed, and you will further appreciate what Matt Carpenter has done for the Cardinals so far this season (FYI: Peter Brand (Jonah Hill) in the movie is Paul DePodesta in the book). The Cardinals have the best record in baseball at 34-17. Matt Carpenter is the biggest reason why they have been able to get off to such a hot start. Sure, they have had vast injuries to the pitching rotation (as I have addressed in previous blog posts), but the Cardinals consistently resisted the urge to trade their young pitchers in the past so they would be able to handle the situation they are dealing with this season. Thus, the starting pitching has been phenomenal this season, but the spark that Carpenter has provided in the leadoff spot has been something the Cardinals have been wanting for a long, long time. The Cardinals are second in the league in on-base percentage, third in runs batted in, and third in runs scored. This can be directly attributed to Carpenter’s ability to get on base in front of the big bats of Carlos Beltran, Matt Holliday, Yadier Molina, and Allen Craig. If the MVP ballot was handed out today, voters would be foolish to not give Matt Carpenter legitimate consideration for the award. This team, and all the adversity it has gone through, would not be where it is today without the incredible performance by Carpenter so far. He is doing all of this for just $504,000 this season–what a steal. With super prospect, Michael Wacha, being scratched from his latest scheduled start for Triple-A Memphis, it appears imminent that he will be called up to fill the hole left by John Gast who was placed on the 15-day disabled list with a shoulder injury. 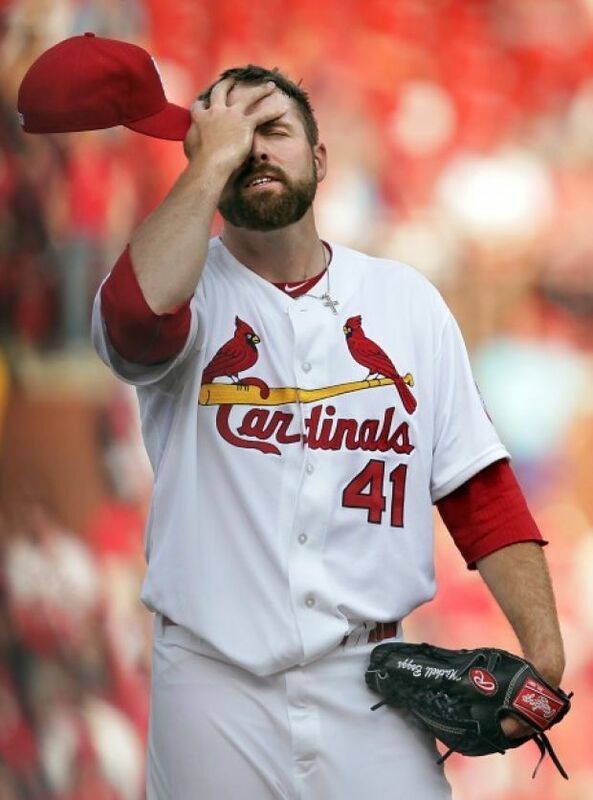 The St. Louis Cardinals pitching staff has been severely decimated by injuries throughout this season, and yet, somehow, they are not in serious trouble just yet. This can be directly attributed to John Mozeliak’s commitment to developing the farm system, all-the-while resisting the urges to trade away one of the organization’s young arms to fill other team needs. Mozeliak’s resistance has paid off immensely, and although it is probably earlier than they had wanted, it looks like it is now Michael Wacha’s turn to join the rotation. Here is everything you need to know about the 6’6″ 21 year old right-hander from Texas A&M. In 2012 in the lower levels of the minor leagues, he pitched in 11 games with 40 strikeouts in just 21 innings pitched. He also had a minuscule earned-run average (ERA) of just 0.86. The Cardinals did their best to put him in the right situations that year, though. Thus, they wanted to see how he performed in Spring Training 2013 before assigning too lofty of expectations to the young righty. Well, he did not disappoint. He wowed everyone in spring–from the fans to the players to the coaching staff. Five-time Gold Glove catcher and team leader, Yadier Molina, said, “That guy right now could pitch in the big leagues. He’s got great stuff. He’s got a great presence on the mound.” However, due to great pitching depth to start the season, Wacha did not make the team and was sent to Triple-A Memphis to further develop his repertoire and gain much-needed professional experience. It was the club’s intention to leave him down there till at least September or even next season, but with injuries to Jaime Garcia, Jake Westbrook, and now John Gast, his time-table to the big leagues has been on fast-forward. He has a solid repertoire of pitches and has the control and endurance needed to be a workhorse starter for the Cardinals. His fastball averages from 92-95 MPH, but he can amp it up to 97 MPH when absolutely necessary. His changeup is outstanding–probably his best pitch. It has late movement that resembles a screwball that dives away from left-handed hitters and gets in on the hands of right-handed hitters. Even Jon Jay said he admires watching the late movement of his changeup when playing behind him in centerfield. Over the off-season and throughout this season in Memphis, he has fine-tuned his 12 to 6 curveball to the point where he can keep it in the strike zone so that he can use it in any situation. One scout says it reminds him of Adam Wainwright’s curveball–which as we all know, is one of the best in the game. Thus, only time will tell how Wacha fares in the big leagues, but it is looking like we will all get our first look on Thursday at 7:15 PM CST against the Royals. 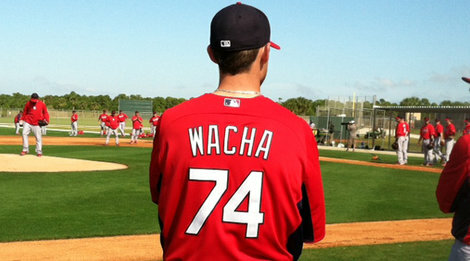 If things go as they have been so far in his professional career, I think Michael Wacha is up for the task. Welcome back, David Freese. The hometown hero might just be getting hot again, and this will be to his benefit if he wants to remain a Cardinal in the future–he will be a free agent at the end of the season. Oh, and the Cardinals will benefit from it as well because they are at their best when he is at third and Matt Carpenter is at second. To the average fan, Matheny may have sounded harsh, but even Freese could not disagree with him. He could not hit for power, had just 4 RBI in his first 27 games, and looked completely lost in most at-bats. 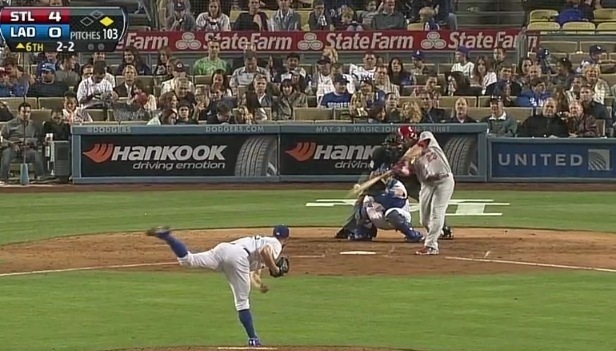 Where was the hitter that locked in to at-bats in the defining moments of Game 6 of 2011 World Series? Was his back injury affecting him more than we thought? It took him until his 92nd at-bat of the season to get his first home run–a first inning grand slam against the Brewers on a belt-high, 86 MPH fastball over the heart of the plate. He had a few good games after that as well, but his hitting revival was halted by a laceration to his finger that kept him out of 3 games. He has 8 RBI in his last 4 games played, and he better keep it up if he wants to remain the 3rd baseman for his hometown team next season. The front office could look for a much cheaper option with Matt Carpenter at 3rd and Kolten Wong at 2nd next season. I have faith that Freese will keep it up as long as he remains healthy for much of the rest of the season. After all, who can doubt a player who hit a game-tying triple with 2 outs and 2 strikes in the bottom of the 9th against a closer with electric stuff in an elimination game of the World Series? I cannot. Plus, he is having fun now, and sometimes that’s all a player as talented as he is needs to turn things around for the better. 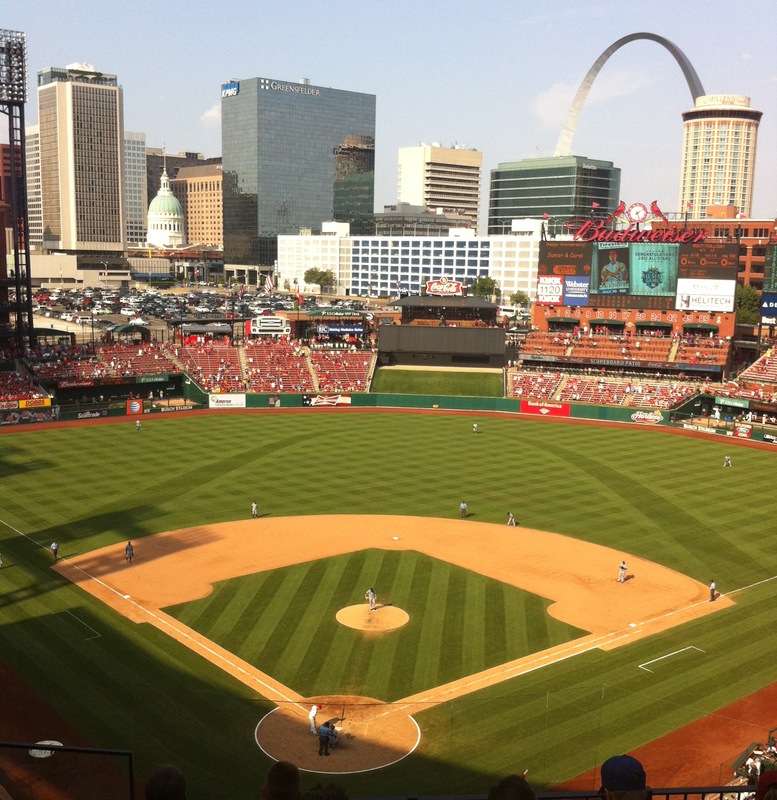 48,263 fans filed into Busch Stadium on Thursday night. According to the @Cardinals, it was the largest ever crowd at a Busch sporting event. We all knew there was extreme interest in the game when it reportedly sold out in less than 20 minutes, but witnessing the sea of blue shirts (the color of both Manchester City and Chelsea) flood the stadium was truly a spectacle. Even though the match was a mere friendly, the atmosphere was still electric. 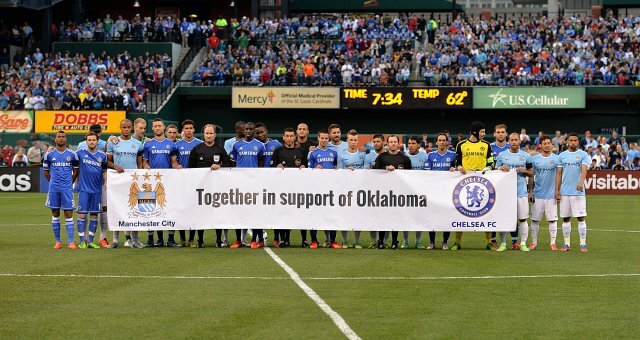 American fans were pumped to finally support their favorite EPL (English Premier League) teams firsthand. It was such a phenomenal turnout that star players like Chelsea’s Mata and Manchester City’s Richards described the atmosphere as “amazing” and “brilliant” on their Twitter accounts after the game. The teams followed through as well and provided the crowd with excitement from start to finish. Throughout pre-game warmups, during player introductions, and throughout the game, the players did a great job at acknowledging the crowd. These gestures made the crowd feel more into the game–resulting in the majority of the crowd standing throughout the game to keep up with the back-and-forth action. From the start, it was apparent that this game was a friendly. The play was wide open because this is what provides the entertainment factor for the fans–not the defense-dominated, possession-oriented 1-0 matches that occur regularly in the Barclays Premier League. Manchester City controlled the game from the opening whistle. Yet, at halftime, the scoreboard did not show it–they were losing 2-0. Chelsea got a header goal from Demba Ba in the 22nd minute on a cross from Mata and a PK goal from Cesar Azpilicueta late in the 1st half. Early in the 2nd half, Chelsea looked like they put the game out of reach with another goal to make it 3-0. However, when Chelsea took out star goalkeeper, Petr Cech, to a large ovation with just under 30 minutes left, Man City finally starting scoring. They scored 2 goals within 2 minutes of Cech leaving the game. Back-and-forth action ensued and Man City netted the equalizer in the 85th minute. Thus, it was 3-3, and if the game ended there, the fans would have had nothing to complain about. Manchester City had other ideas, though. The clock struck 90 minutes and with just 2 minutes of stoppage time, they pushed the ball forward looking to complete the epic comeback with a victory. On a beautiful flick from a teammate’s head, Micah Richards buried the game-winning goal. Manchester City 4: Chelsea 3. Thus, the makeshift home team, Chelsea, blew a 3-0 lead, but the crowd did not mind because the two teams provided entertainment worth the price of admission. It was a tremendous event, and St. Louis shined on the worldwide soccer stage. Events like this has to make you wonder how long it will be until St. Louis gets an MLS team of its own. Well done, St. Louis. Well done. Starting at 7:30 PM Central Standard Time on May 23rd, 2013, the soccer crazies of St. Louis will be able to experience a taste of European “football” for the first time at Busch Stadium III. Grounds crew members went to work transforming the baseball field into a proper soccer pitch (that is what a soccer field is called across the pond in England) on May 20th, as soon as the Cardinals left town for the series against the Padres in San Diego. I was lucky enough to get in contact with one of the Cardinals’ grounds crew members to help give my readers an inside look at what was needed to transform the baseball diamond into a soccer pitch fit for 2 of the top teams in England–Chelsea and Manchester City. “It’s a very tedious process,” said the grounds crew member. “We first had to take all of the infield mix off the top of the clay. After that, we had to take an inch and a half off of the clay in order for the sod to be level with the grass that is already there.” (The very beginning of this process is illustrated by the picture shown above). 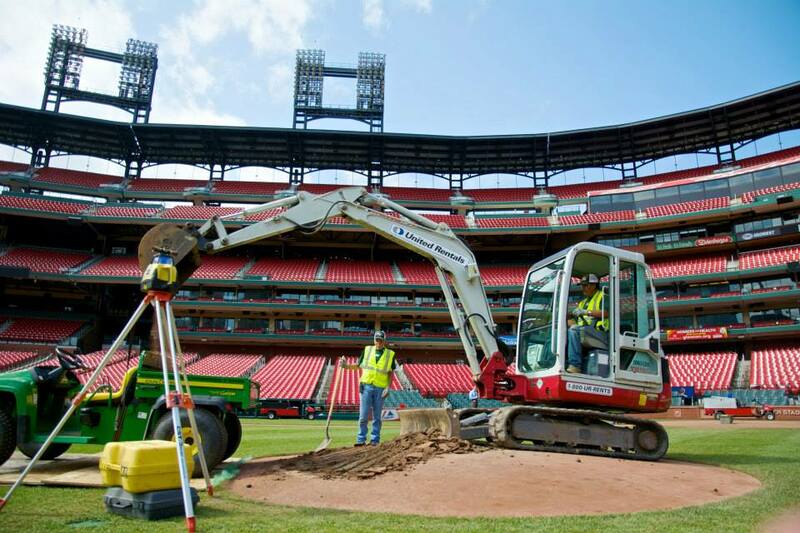 The Cardinals even brought in a small bulldozer to help remove the pitcher’s mound so that it was level with the rest of the playing surface (shown below). 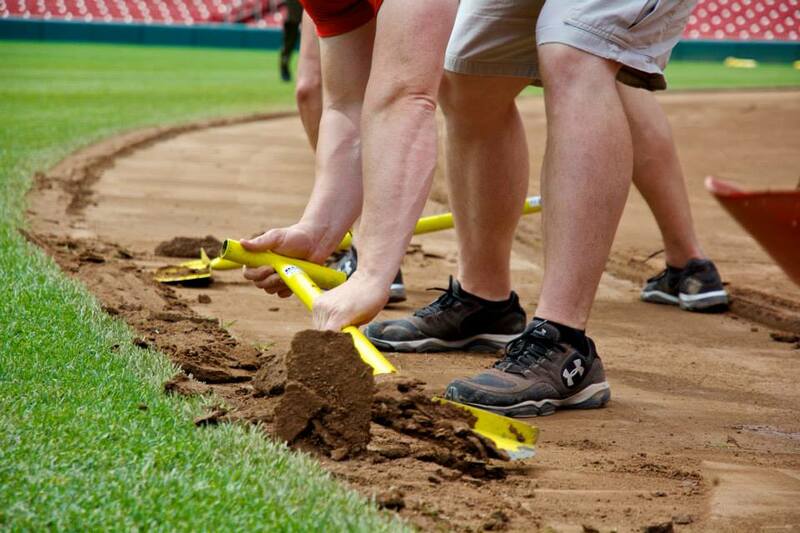 To make the overall process run smoothly, the Cardinals brought in Bush Turf, a company located in Milan, Illinois, to help with the sod installation after dirt and clay removal provided a level surface. Chelsea, the 3rd place finisher in the Barclays Premier League this season, sent their head grounds keeper over early to make sure that the field met his specifications. When asked if the storms would affect the process, the grounds keeper assured me that it would not be that big of a deal because they got the hard part (dirt and clay removal) finished before the arrival of the storms. They were then able to put the tarp over the field so that it would not affect the sod installation that started at 7 AM this morning (May 21, 2013). Thus, by game time on Thursday evening, Bill Findley’s terrific grounds crew will have worked nearly 40 hours to produce a pitch that meets the specifications of the 2 Premier League teams. 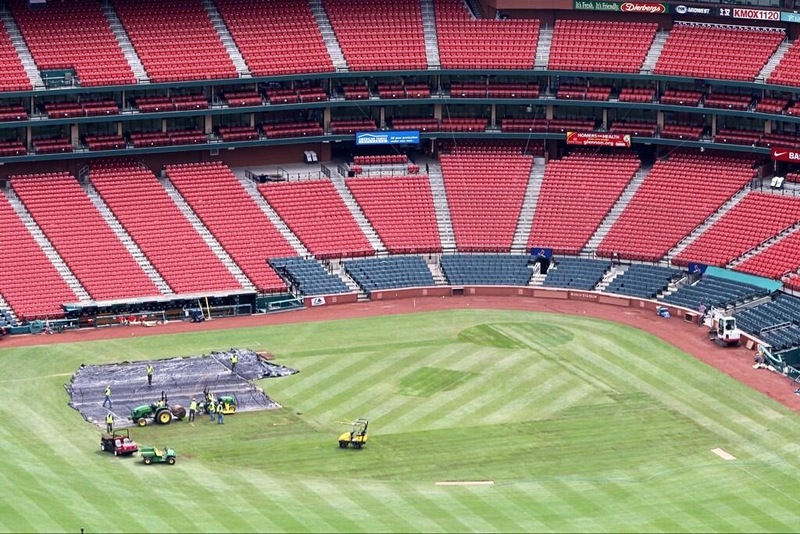 By the end of the week, the grounds crew members will most likely have to be reminded that they are employed by the Cardinals and not the Premier League given the 12+ hour work days they have put forth over the past 3+ days to transform the baseball diamond into a soccer pitch for just one game. Turf removal will occur immediately after the game and returning it to playing shape for the Cardinals will be complete by the the time the team returns home to play the in-state rival Royals on May 29th. When asked if any long-term consequences may occur considering the problems that that resulted from the U2 concert in 2011, he replied, “The replacing part shouldn’t be bad. We have saved everything that was removed, and it will go right back on the diamond as soon as the soccer game is over. Our crew and Bush Turf do a great job, and we have the right equipment so it should not be that difficult. It won’t be as bad as the U2 concert, that’s for sure.” This is most likely because the crew did not have to remove the outfield turf (and replace it) like they did for the U2 concert. Thus, expect the field to be looking back to normal by the time the Cardinals return home without any negative repercussions for the rest of the season. After the game is over, I am sure the grounds crew will further appreciate their job as Cardinals grounds keepers and enjoy having their daily tasks return to normal. I will write a post on the game itself as well, so be on the lookout for that Friday morning/afternoon!